Had a problem recently with our Xantrex inverter. (Pictures at end of this post) The remote panel would not shut off when the on/off button was pressed. Nothing in the troubleshooting section of the manual which referenced such an issue, so I gave their customer service number a call. After a lengthy hold time waiting for an agent, finally got someone who seemed fairly knowledgeable about the product. She basically had two possible solutions for me: a 'soft' reset and a 'hard' reset. The soft reset involved disconnecting (for 10 mins) the 'phone' type cable that runs from the inverter to the remote panel. This is done at the inverter under the passenger side bed (on a 2552). Tried that....no luck. The hard reset involved removing all power to the inverter itself (disconnecting power source cables from the inverter). This did not work either, so I started looking for alternatives. I decided to remove the remote panel from the wall behind the drivers seat. There I found that the other end of the phone type cable and the remote panel cable both plugged into a female-female adapter. When I removed the remote panel cable from the adapter I found it had shorted out inside the adapter. Easy fix to replace the adapter and replace the RJ11 connector on the end of the phone cable. Requires a special stripper/crimper hand tool and a spare RJ11 connector, which I bought on Amazon. Total cost was about $20. Hard to determine exactly why the short occurred, but my best guess is that the adapter just dangles on the cables behind the wall and may have just caused the connections to rub too much due to vibration. Nice research and repair you did there Pax/Mike. I wonder if Xantrex is pumping more amperage through that connector than it is rated for. Or like you say, it could be a fluke. You'll know for sure if you repeat the repair over and over again. Since nobody else has posted this sort of thing, I lean toward a once-&-done repair. Pax/Mike.. Good trouble shooting as Ron mentioned. Question: how did you conclude that the rj11/and adapter, was bad? Was it burned and looked bad, or did you do a ohmmeter test? If it was a burned appearance, than Ron you may have a point with too much current. My Xantrex died this last season in Arizona, so upgraded to the new 2000 pure sine wave model. Not that happy with the first unit, as it tripped GFI's when on shore power, and was very high RFI noise. Being in ham radio, this wasn't a good thing. They sent me another unit, but just installed it and don't know about the GFI problem as of yet. RFI noise was about the same, but adding some toroide chokes on the 12 volt cables and a 22000MFD capacitor across the 12 volt cables, killed most of the noise. At least made it manageable, radiowise. The adapter and connector were indeed burned (you can see it in the picture if you zoom in), but only on the side where remote panel attaches to it. Didn't have time to do any further testing, but will next week for sure. Just wanted to get it operational so I could turn it off and not drain down the battery. One thing I did notice was that there are many of those pass-thru connectors available and they all look very similar, although. Could not get any technical specs on any of them. They ran from $1.99 to $7.00 or so. I decided to buy the GE branded one for about $5.00. The cable connectors fit much better in this GE unit....more snugly. You say it was 'kind of a pain' to replace your cable with an RJ45? Care to elaborate? I would think it would be a 'huge pain'! Is the unit located in the same place in your 2350 as in a 2552? Did the cable run over the ceiling to the opposite side of the rig? Mike, When I said a bit of a pain, I really meant a BIG pain. Actually what it amounted to was to drill a hole in floor below remote unit, and string the new cable under the MH to the opposite rear corner of the rig, drilling another hole to bring it back up. It was a chore to fish the new cable up over the top of the heat shields to keep it out of trouble. Then I tie-wrapped it in various places along its route. Old cable looks like was ran with the other cables along the wall/floor. Left it where it was since it was still good. But certainly not happy to hear the connector was indeed burned. Poor engineering, or what? Maybe the F-F connector was bad and not making good connection. Sometimes those wire fingers get out of their little grove and don't connect correctly like that. Well, let's hope this was just a fluke. Not good to find burned stuff in our walls! That is what came to mind when I seen the connector burnt. Though a rare occurrence, it is more common with cheap no-name connectors. The metal contacts inside can be poorly assembled causing weak spring tension which encourages arcing, eventually the burning Pax/Mike had. I think Pax/Mike had the right idea in spending more to purchase a name brand connector. Not just for the hope to be assembled better, but also for better plating on the contacts. For this particular application, it was smart to go with a brand name. Whether cheap or name brand, be sure to inspect the contacts inside the connector before using it. They need to be lined up like little solders in there. 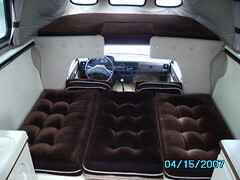 Hmm, that's another do it yourself project we may pay Phoenix to do - convert the passenger side bed in our 2552 to lift like the driver's side does so we can access those components stashed under there. I figure they don't want people messing with them but I can be well behaved with that. I'd just like to be able to see them, test them and resecure them when necessary... and eventually go for that pure sine wave inverter to protect phones and such. John, Holly, and sometimes Chloe. I think the factory does that to be child-proof. It may be a law or an insurance requirement. Immediately after we bought our PC, I modified the means to access our inverter. At least in our particular application, they made it easy enough to change. It was simple to remove the two hinges that sealed the access door, add a latch to keep it closed, and finish up with a matching door knob. I have been in that compartment countless times to turn the inverter on/off because the control panel does not completely kill our old Tripp-Lite inverter. When on trips, we keep it turned off most of the time to conserve battery power. I think the newer inverters don't have that issue. Ours is 9 years old now. On the 2552 passengers side bed there are about a dozen screws that have to be removed in order to lift the bed board off. A cordless screw driver and about three mintes is all it takes to gain access. I have only needed to be under there once in the last five years in order to have a water pump replaced. I felt it was not worth the effort, time or money to rebuild the bed and add a hinge. You have to add another brace to attach the hinge to, not a small task. Don't worry about it until you need to, just have fun. 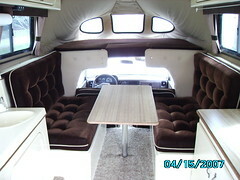 We had a similar condition in our first motorhome seen here with both dinette bench seats. Like you Pax/Mike, I let the platforms just sit in there. In our case they were located right behind the driver & passenger. They rattled while driving which made us crazy. Worse yet they squeaked with every little movement when sleeping on it. I resolved the matter using the clothy side of self-stick Velcro on a roll, using it as a perimeter gasket. If I added the plastic hook side of the Velcro all around on the mating surface, I'd never be able to remove the platforms. It worked so well that I never gave any thought to adding a few spots of the hook side of Velcro. But it might be beneficial in a PC. I also drilled a 1" hole in a good area to get my finger in there to easily lift the platform. In the case with a standard single PC bed, maybe two holes spread apart, one for each hand would be better. I think we need to formalize the naming convention of the component parts of Velcro. I use Posicro for the hook side and Negacro for the loop side. Of course, it's a battle with SpellChecker on the latter name. Just sayin'. I think we need to formalize the naming convention of the component parts of Velcro. I use Posicro for the hook side and Negacro for the loop side. JFCaramagno - You have messed with my head with those names. They sound like little superheros. Now every time I see velcro, images of tiny little dudes in spandex will flash through my brain. Tom - thanks for the vote for sanity. I'm good with less work. I did take that bed board off once to sand and finish it to avoid any splinters so I know I could do it again if needed.